The IS-7 is the pinnacle of the infamous Russian bias that stronk tank lovers are so fond of. Its turret is generally invulnerable to nearly every shell in the game (HE always does damage), except to notable Tier 10 TD premium HEAT shells, like the JagdPanzer E-100. Not only is this Russian heavy tank a hull-down monster in battle, but it also has magic black hole spaced armour on its sides that will eat shells all day without taking damage. Couple this with a heavily sloped pike nose for frontal armour, the IS-7 is amazing for hull down engagements, frontal breakthrough assaults and holding choke points. There is a very good reason why the IS-7, and indeed the entire line preceeding it, is recommended as an entry-level heavy tank for new (or old!) WoT players. With some of the strongest armour in the game from just about any angle, it is extremely forgiving if you happen to get into trouble. The armour scheme may keep new and inexperienced players alive for longer, but it only enhances the carry-potential for more experienced players. Yes, the gun may be irritating at times with its unreliably poor accuracy, poor DPM and relatively low penetration, but one cannot argue with armour this effective - sometimes the best offence is a near impenetrable defence. For sure, this tank is one of the better Tier 10s in the game, and certainly one of the best heavies - both in E-Sports and in pub games. As you can see, unangled, the frontal armour is tough. The frontal turret effective armour ranges from roughly 315mm to well over 1000mm of armour. The frontal pike nose is heavily sloped at 295mm to 370mm of armour. The lower frontal plate is the main weakspot, but will still bounce most lower tier guns at 220mm to 230mm of effective armour. Although the side spaced armour will result in an effective 300+ mm of armour when angled, it does reduce the effective frontal armour of the pike nose - the side that is facing the enemy is reduced to around 220mm to 230mm of effective armour. Wiggling the tank back and forth is a good way to bounce shells aimed at your weakspots. When the match starts, be sure to analyse your team composition and the map. Think about the best flank to dominate and find a position where you can hide your hull (or lower plate at least) and allow your turret to shine in a hull-down position. You can pretty much laugh at most tanks that attempt to penetrate your turret, as most will fail. Beware however of The T110E3, T110E4, JPE-100, and occasionally the Obj 268 gold rounds, as they can penetrate your turret frontally. Of course, be aware of enemy SPGs, as high tier artillery shells will not be kind to your tank. 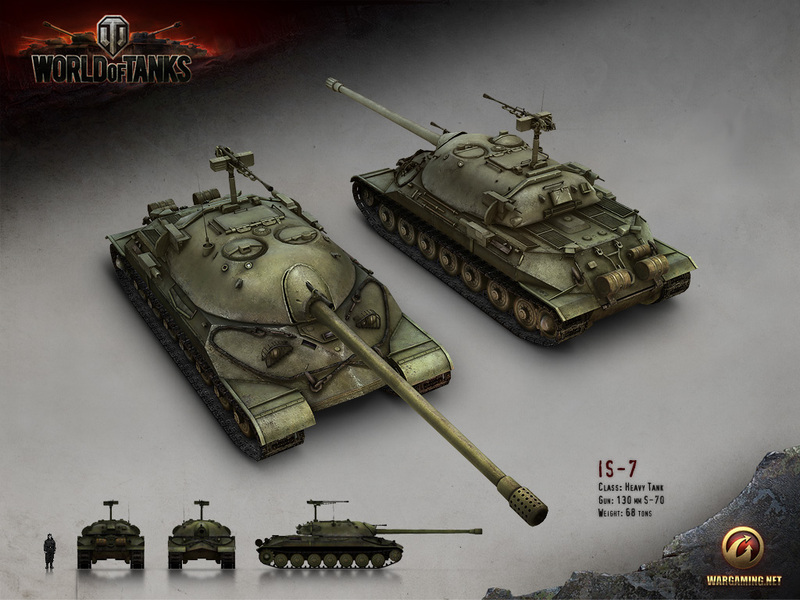 The IS-7 should be a front-line tank, as the high top speed (you can hit nearly 60kph downhill) allows you to get into forward positions quickly and bully lower tier tanks that have been caught out of position by playing too aggressively. Sniping with this tank is not advised, as the combination of poor accuracy and dispersion, as well as the relatively low AP penetration will cause some frustration. Personally, I like to load a generous amount of APCR and get up close and personal. Facehugging enemy tanks is a great way to bully them into submission. Near impenetrable turret armour - American hull down tanks have nothing on this. Magic spaced armour - get the idea yet? HEAT shells will be ineffective when shooting the IS-7 in the side. Poor gun handling - long aim time, poor DPM, poor accuracy, and relatively poor penetration for the AP round at 250mm. The IS-7 has effectively been power-creeped since its release, with its gun handling not having been updated to match the current heavy tank stats. However, the 490 average damage and 303mm APCR gold round penetration make up for it. The soft stats hurt this tank significantly, with bad ground resistance, awful hull traverse, and bad gun bloom. Low ammo capacity at just 30 rounds. Frontal ammo racks are fairly common, as the ammo rack is located just behind the frontal pike armour. The fuel tanks are stored just behind the lower frontal plate, so frontal fires are common. Automatic extinguishers are a must. I run 13 AP/15 APCR/2 HE - I find it to be a good mix of silver and gold rounds. As you can see, I am fairly liberal with gold usage, especially when engaging other heavily armoured tanks, such as other IS-7s, IS-4s and E-100s. Plenty of players will also run full APCR loadouts due to the penetration advantage and significantly higher shell velocity. The APCR rounds are also quite cheap, and it is definitely possible to make a profit with just APCR if you penetrate every round. Vertical Stabiliser, Shell Rammer, Enhanced Gun Laying Drive/Improved Ventilation. There is some debate between the GLD and Vents. Personally, I like to run the GLD as the extra 10% aim time can be useful in targetting enemy weakspots at mid - long range engagements (yes, I know I said this is a terrible sniper, but sometimes when moving to a new location, damage is damage). However, the vents is also highly viable, as squeezing out the extra DPM out of the gun and improving the soft stats in a brawl is extremely useful. If you have Vents + Brothers in Arms perk, it certainly helps the tank out a fair bit. In the end, the decision is purely up to player preference and individual playstyles. *The second loader has to be in the second spot as he is also the radio man. Russian bias is best bias. Very stronk tenk. Hide your lower plate, get hull down, bully lower tier tanks and those with less armour than you. I hope you enjoyed the article, and thanks for reading!